TOMÁS BUELTA Y FLORES (1791-1844): La Valentina, ENRIQUE GUERRERO (1818-1887): La que a ti te gusta, CÉSAR PÉREZ SENTENAT (1896-1973): Palmas reales rubias, AMADÉO ROLDÁN GARDES (1900-1939): Mulato, ALEJANDRO GARCÍA CATURLA (1906-1940): Comparsa, JOSÉ ARDÉVOL GIMBERNAT (1911-1981): Danzón, EDGARDO MARTÍN CANTERO (1915-2004): Preludio No. 6, ARGELIERS LÉON (1918-1991): Invención No. 3, vNILO RODRÍGUEZ SUÁREZ (1921-1997): Preludio No. 3: Motivos de danza, HÉCTOR ANGULO (b.1932): Zapatéo Cubano, ROBERTO VALERA (b.1938): Cuento sonoro, LÉO BROUWER (b.1939): Boceto No. 4 ”Acosta Leon”, JUAN PIÑERA (b.1949): Y el brillo de la luna te encantaba, Estudio de concierto, ANDRÉS ALÉN (b.1950): Que confusión de tonos, JOSÉ MARÍA VITIER (b.1954): Habanera del angel, ERNÁN LÓPEZ NUSSA (b.1958): Niña con violin, ALDO LÓPEZ GAVILÁN (b.1979): Pan con “Timba”. 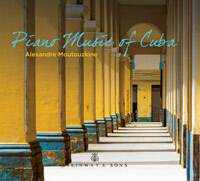 Description: A small example of the unknown solo piano repertoire of Cuba, a world of rich, complex harmonies, percussive statements, and swirls of imagination. Many of these rarely heard works have never before been recorded. As the pianist here puts it, “...every new Cuban composer whom I have come across has presented a feast of musical discovery. Roldan and Caturla create lush harmonies that are disparate and unique, yet work together in flawless layers. Roberto Valera’s witty, captivating mind and masterfuk craft radiates with depth and dimension. The breathtaking delicacy and charm of Léo Brouwer is mesmerizing. Then there is the absolutely enchanting world of Juan Piñera. Thankfully, the list goes on and on.” Alexandre Moutouzkine (piano).